Most Americans use mustard on there hotdog. But mustard is known worldwide and is used in many kitchens. I have to disappoint you right away if you where thinking that the mustard on your hotdog is good for your skin. It could be very healthy if they didn’t add so many sugars and other bad stuff in it. But mustard (as well as mustard oil), is very good for your skin and health if you know which one you have to pick out. There are so many varieties of mustard; American mustard (Yellow mustard in North America), Spicy brown/deli-style mustard, beer mustard, dijon mustard, whole-grain mustard, English mustard, French mustard, Dutch mustard, Honey mustard, fruit mustard, hot mustard, spirited mustard and sweet mustard. Some of these mustards are NOT healthy at all and it is NOT benefited for your skin. How to choose a healthy mustard, which is also beneficial for your skin? 1) Do NOT go for a fat-free mustard. You probably be surprised, but a fat-free mustard has double the calories and lots of added stuff which isn’t good for anything. One tablespoon of full-fat mustard has about 50 calories and 5 grams of fat. Mayonnaise, for instance, has double the fats and calories. 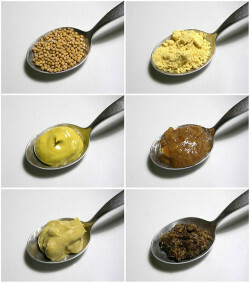 BUT the BIG DIFFERENCE is that the fat of mustard actually is beneficial for your skin, health and does easily digest. 2) Go for plain mustard. If it’s added with turmeric it’s no problem. But watch out for to much added sugars, salt etc. 3) Still not convinced in finding a good mustard? You can make mustard yourself! Just Google; DIY mustard. Why is mustard beneficial for your skin and what does it contain? The mustard seeds (number 1 ingredient of mustard) devoid trans-fats, is low in saturated fats and has a high content of mono-unsaturated fats and polyunsaturated fatty acids such as omega-3. Besides mustard seeds contain flavonoid and carotenoid anti-oxidants such as carotenes, zea-xanthin, and lutein also know as the flavonoid anti-oxidants. The seeds are also a great source of vitamin E, gamma tocopherol; contain about 19.82 mg per 100 g, which is 132% of RDA. Vitamin E is a powerful lipid soluble antioxidant, required for maintaining the integrity of cell membrane of mucus membranes and skin by protecting it from harmful oxygen-free radicals. To make a long story short; Mustard contains different kind of anti-oxidant components, which eventually slow aging. NOTE: As I wrote earlier, mustard has quite some calories, so the best way to go is to use mustard instead of mayonnaise. Just keep it in your fridge and use it sometimes with, for instants, broccoli. Other benefits of mustard are: Can be beneficial during Asthma, Anti-inflammatory, Stimulates hair growth (Not proven), has anti-bacterial properties, reduces the risk of colorectal and gastrointestinal cancer (Not proven).